Benjamin Graham taught that Intelligent Investors must do a thorough fundamental analysis of investment opportunities to determine their intrinsic value and inherent risk. 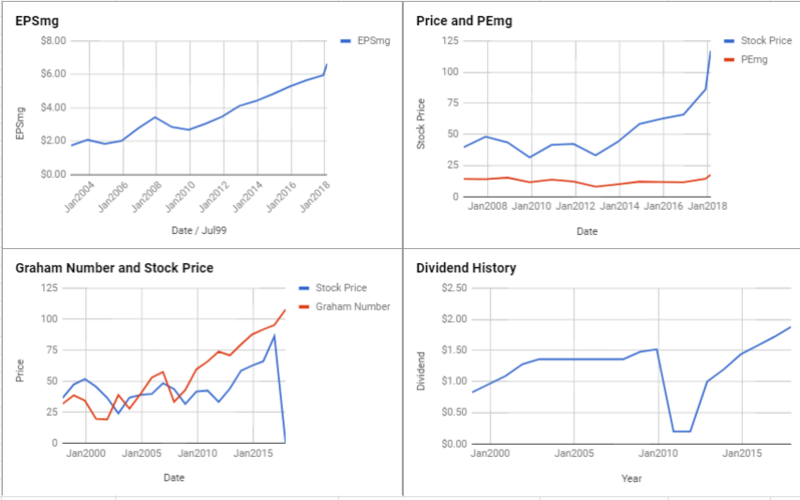 This is best done by utilizing a systematic approach to analysis that will provide investors with a sense of how a specific company compares to another company or by reviewing the 10 Companies Benjamin Graham Would Invest In Today – July 2016. By using the ModernGraham method one can review a company’s historical accomplishments and determine an intrinsic value that can be compared across industries. What follows is a stock analysis showing a specific look at how JPMorgan Chase & Co (JPM) fares in the ModernGraham valuation model. Company Profile (obtained from Google Finance): JPMorgan Chase & Co. is a financial holding company. The Company is engaged in investment banking, financial services. It operates in four segments, as well as a Corporate segment. Its segments are Consumer & Community Banking, Corporate & Investment Bank, Commercial Banking and Asset Management. The Consumer & Community Banking segment serves consumers and businesses through personal service at bank branches and through automatic teller machines, online, mobile and telephone banking. The Corporate & Investment Bank segment, comprising Banking and Markets & Investor Services, offers investment banking, market-making, prime brokerage, and treasury and securities products and services to corporations, investors, financial institutions, and government and municipal entities. The Commercial Banking segment provides financial solutions, including lending, treasury services, investment banking and asset management. The Asset Management segment comprises investment and wealth management. 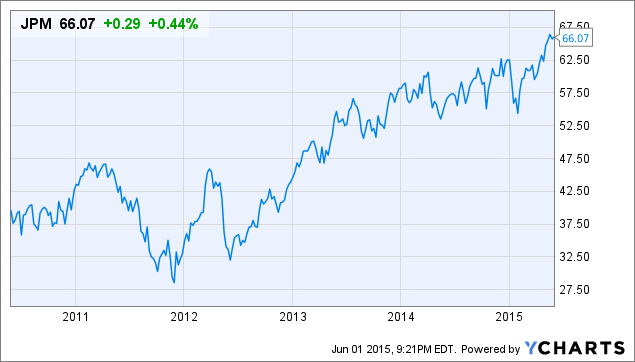 JPMorgan Chase & Co. performs fairly well in the ModernGraham grading system, scoring a B+. Benjamin Graham taught that Intelligent Investors must do a thorough fundamental analysis of investment opportunities to determine their intrinsic value and inherent risk. This is best done by utilizing a systematic approach to analysis that will provide investors with a sense of how a specific company compares to another company or by reviewing the 10 Most Undervalued Companies for the Defensive Investor – November 2015. By using the ModernGraham method one can review a company’s historical accomplishments and determine an intrinsic value that can be compared across industries. 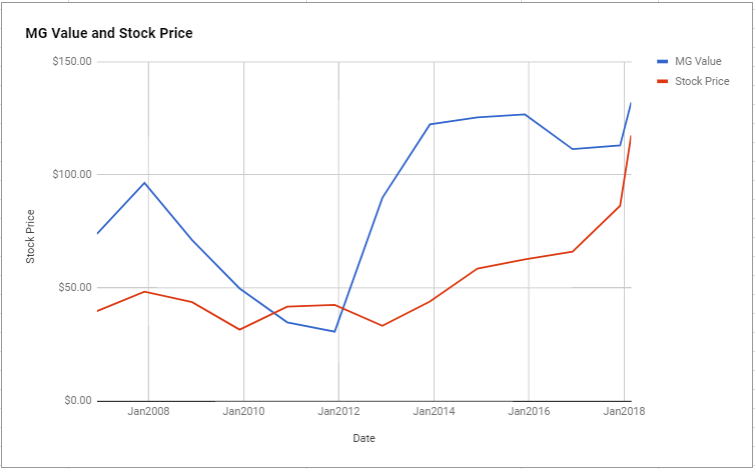 What follows is a stock analysis showing a specific look at how JP Morgan Chase (JPM) fares in the ModernGraham valuation model. 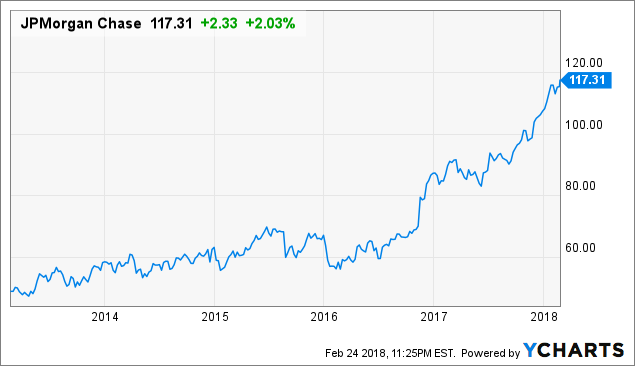 As for a valuation, the company appears to be undervalued after growing its EPSmg (normalized earnings) from $4.11 in 2012 to an estimated $5.48 for 2016. This level of demonstrated earnings growth outpaces the market’s implied estimate of 0.83% annual earnings growth over the next 7-10 years. 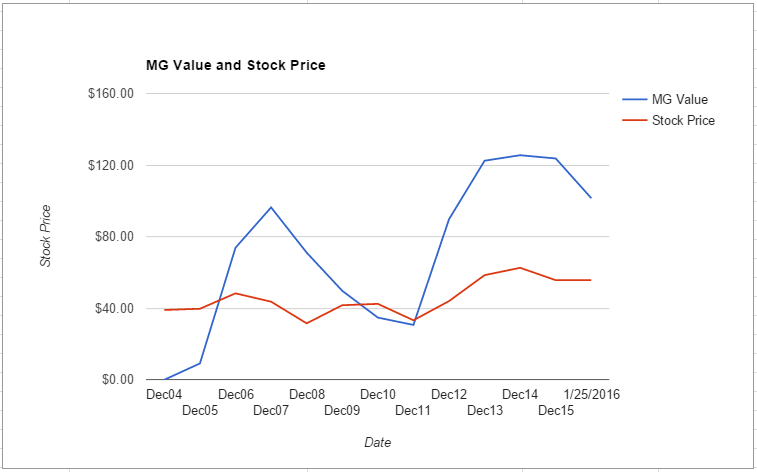 As a result, the ModernGraham valuation model, based on Benjamin Graham’s formula, returns an estimate of intrinsic value above the price. The next part of the analysis is up to individual investors, and requires discussion of the company’s prospects. What do you think? 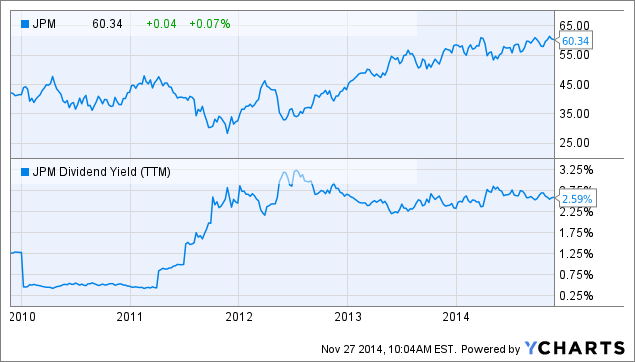 What value would you put on JP Morgan Chase (JPM)? Where do you see the company going in the future? Is there a company you like better? Leave a comment on our Facebook page or mention @ModernGraham on Twitter to discuss. 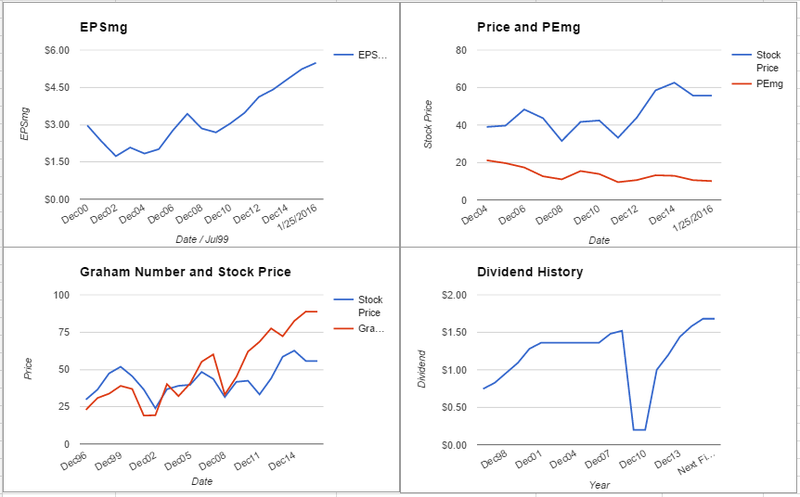 When it comes to that valuation, it is critical to consider the company’s earnings history. 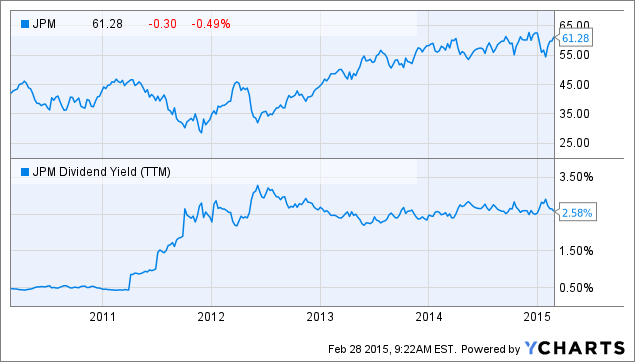 In this case, the company has grown its EPSmg (normalized earnings) from $3.05 in 2010 to $4.82 for 2014. This is a strong level of demonstrated growth, which is well above the market’s implied estimate for earnings growth of only 2.13% over the next 7-10 years. In fact, the historical growth is around 11.64% per year, so the market is expecting a very significant drop in earnings growth. 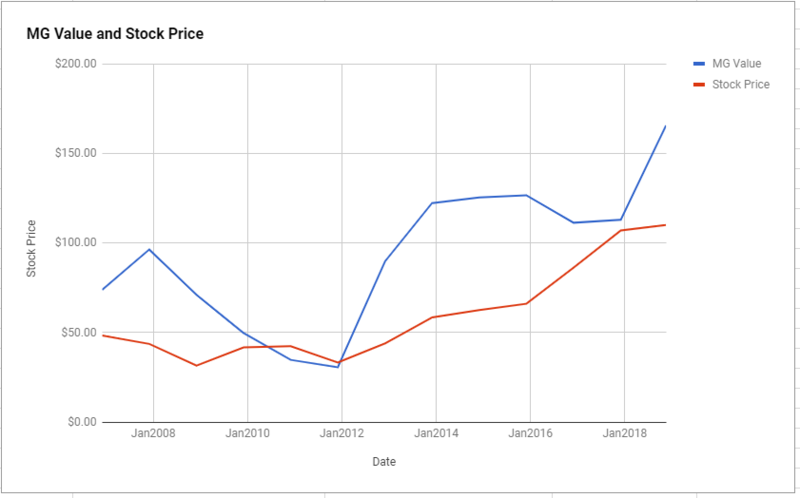 The ModernGraham valuation model reduces the historical growth to a more conservative figure, assuming that some slowdown will occur, but still returns an estimate of intrinsic value falling above the current price, indicating the company is undervalued at the present time. Be sure to check out our previous ModernGraham valuations of JPMorgan Chase for a greater perspective! Disclaimer: The author did not hold a position in JP Morgan Chase (JPM) at the time of publication and had no intention of changing that position within the next 72 hours. Logo taken from Wikipedia for the sole purpose of identifying the company; this article is not affiliated with the company in any manner. JPMorgan Chase performs extremely well in the initial stages of the analysis, passing all of the requirements of both the Enterprising Investor and the Defensive Investor. 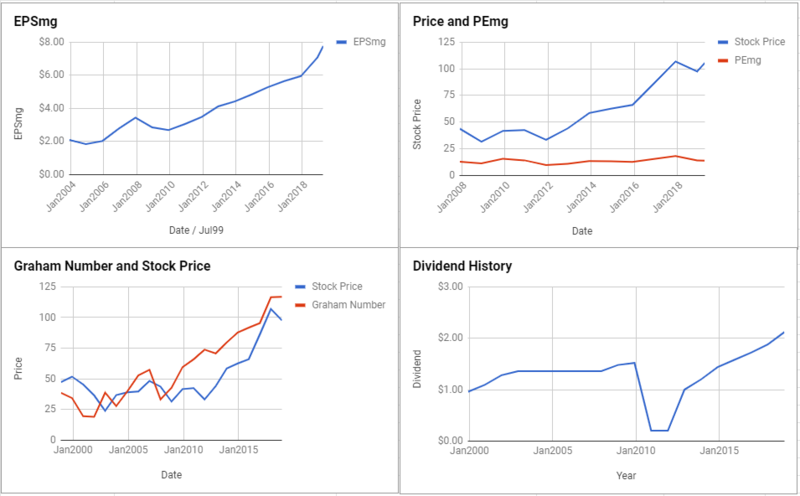 Any value investor following the ModernGraham approach based on Benjamin Graham’s teachings should feel very comfortable proceeding to the next part of the analysis, which is a determination of the company’s intrinsic value. To determine an estimate of the intrinsic value, one must consider the company’s earnings. 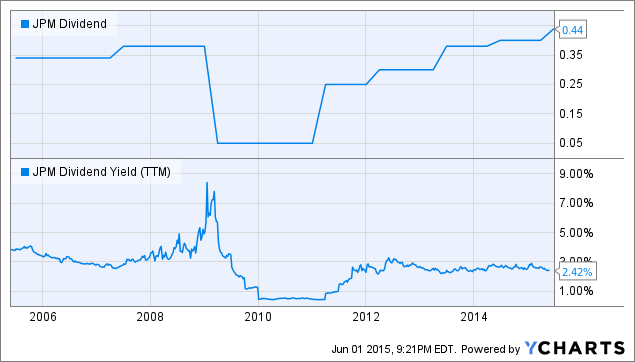 Here, the company has grown its EPSmg (normalized earnings) from $3.05 in 2010 to an estimated $4.83 for 2014. This is a strong level of growth, approximately 11.66% each year. Even adjusting for a margin of safety to assume the company will not do as well in the future, a conservative growth estimate may be around 8.74%, which is well above the market’s implied forecast of only 2.01% earnings growth over the next 7-10 years. 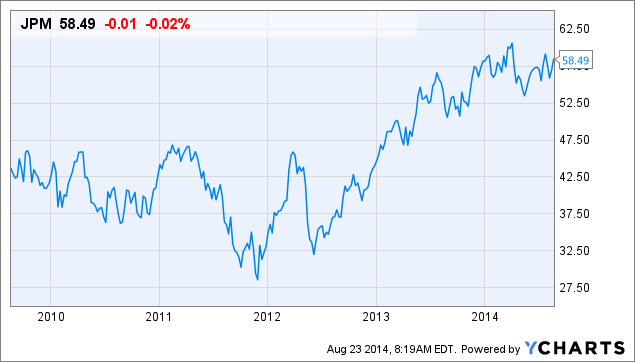 The company would have to see a significant slowdown in growth in order to be valued at the market’s current price. 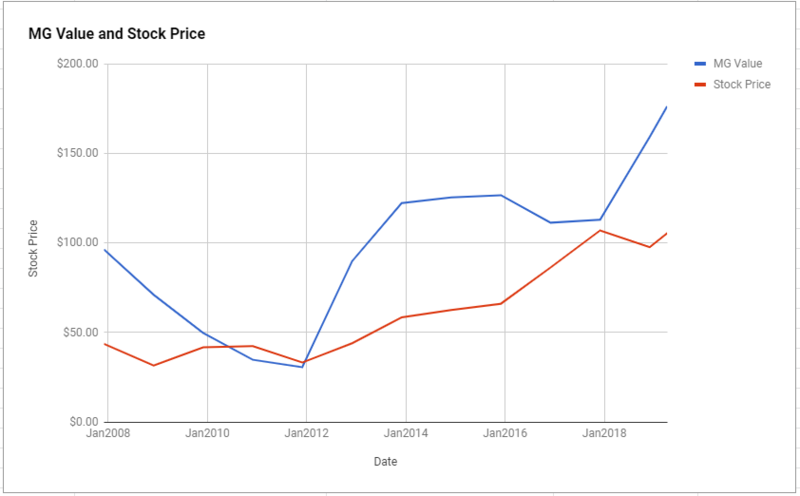 As a result, the ModernGraham valuation model returns an estimate of intrinsic value well above the price, supporting a clear conclusion that the company is significantly undervalued. All value investors are therefore encouraged to proceed with further research to determine whether JPMorgan Chase is suitable for their own individual portfolios. 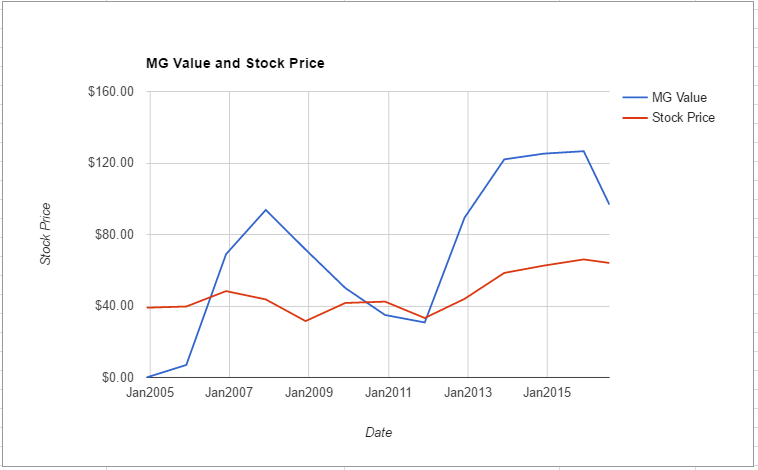 Be sure to check out previous ModernGraham valuations of JP Morgan Chase for better perspective. Disclaimer: The author did not hold a position in JP Morgan Chase (JPM) or in any other company mentioned in this article at the time of publication and had no intention of changing that position within the next 72 hours. Logo taken from Wikipedia for the sole purpose of identifying the company; this article is not affiliated with the company in any manner. In the wake of the great financial crisis it can sometimes be difficult for Intelligent Investors to find a solid financial company in which to invest, because they require specific achievements over the historical period. Many investors may simply decide to throw out the worst years with the rationale that they are outliers that shouldn’t be considered when evaluating the company’s prospects, but doing so would involve speculation. We don’t know whether the financial crisis will happen again, but we do know that if it does, we can expect to see similar results as we did before. By continuing to require the same standards for the historical period, Intelligent Investors are able to whittle down banks to only those with the best financial position, and then they are able to determine an intrinsic value to get a sense of whether the company is a good investment. In addition, a company must have strong financial statements to prove that it is stable enough for Intelligent Investors. This is best done by utilizing a systematic approach to analysis that will provide investors with a sense of how a specific company compares to another company. By using the ModernGraham method one can review a company’s historical accomplishments and determine an intrinsic value that can be compared across industries. 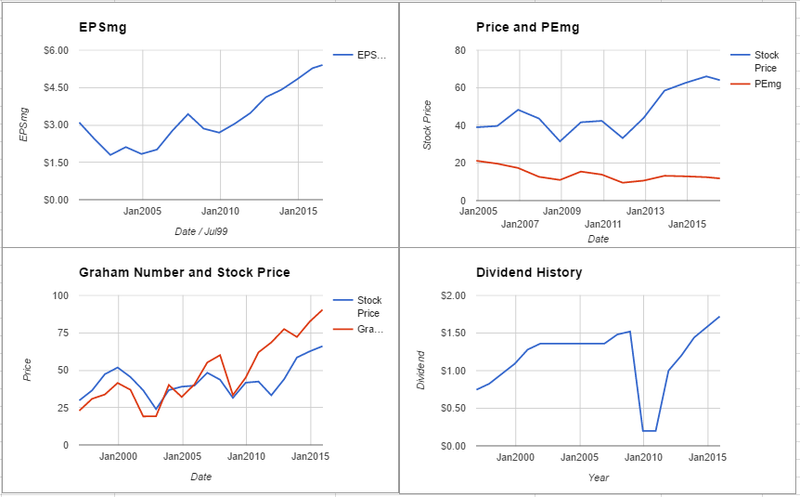 What follows is a specific look at how JP Morgan Chase (JPM) fares in the ModernGraham valuation model. Company Profile (obtained from Google Finance): JPMorgan Chase & Co. (JPMorgan Chase) is a financial holding company. The Company is engaged in investment banking, financial services for consumers and small businesses, commercial banking, financial transaction processing, asset management and private equity. One of the Company’s principal operating subsidiaries in the United Kingdom is J.P. Morgan Securities plc. JPMorgan Chase’s activities are organized into four business segments, as well as Corporate/Private Equity. The Company’s consumer business is the Consumer & Community Banking segment. In March 2014, Aurora Oil & Gas Ltd announced that JPMorgan Chase & Co and its affiliates has ceased to be substantial shareholder of Aurora Oil & Gas. In March 2014, Slater & Gordon Ltd announced that JPMorgan Chase & Co and its affiliates has ceased to be substantial shareholder of the Company. In May 2014, the Company and its affiliates ceased to be a substantial share holder of Windimurra Vanadium Ltd.
JP Morgan Chase is suitable for either the Defensive Investor or the Enterprising Investor, as the company passes all of the requirements of either investor type. 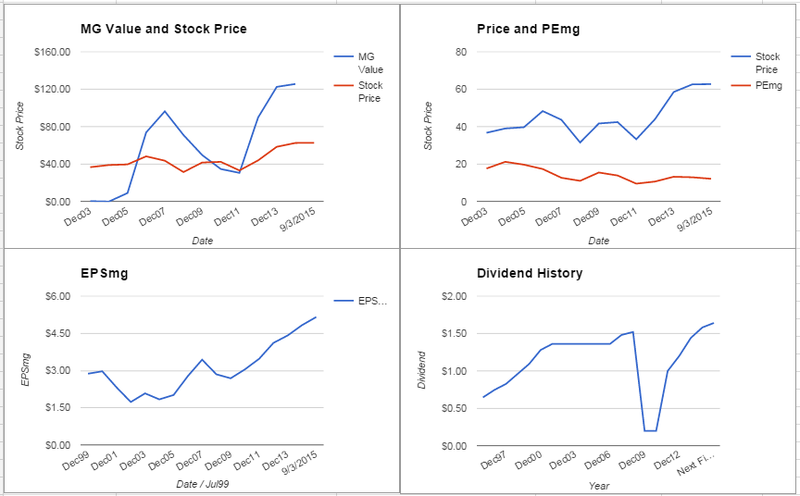 As a result, value investors following the ModernGraham approach based on Benjamin Graham’s methods should feel comfortable proceeding with further research into the company and comparing it to other opportunities. 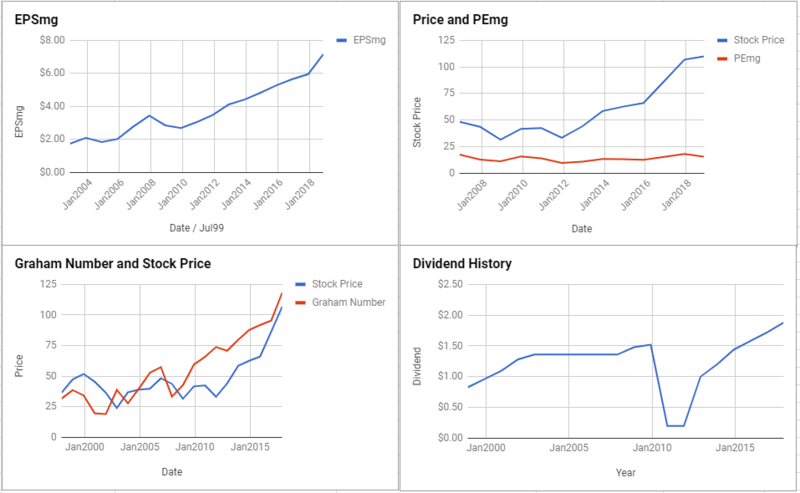 As for a valuation, the company appears undervalued after growing its EPSmg (normalized earnings) from $2.92 in 2010 to an estimated $4.82 for 2014. 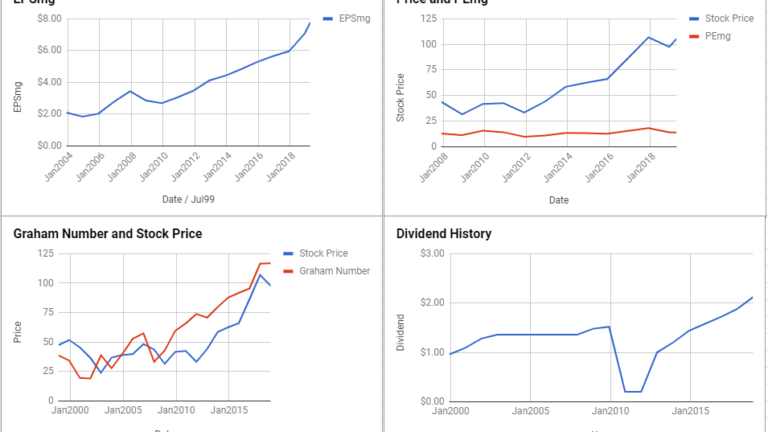 This level of demonstrated growth outpaces the market’s implied estimate of 1.82% earnings growth and leads the ModernGraham valuation model, which is based on Benjamin Graham’s formula, to return an estimate of intrinsic value above the market price. 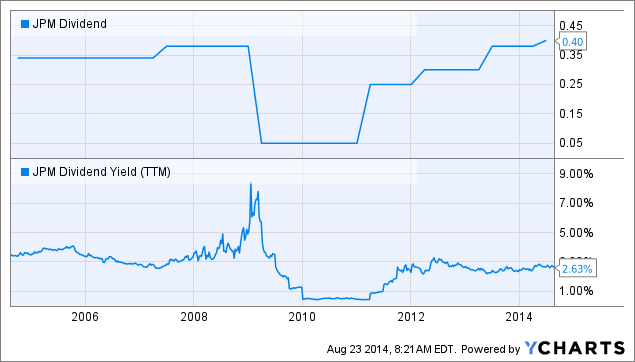 Be sure to check out the previous ModernGraham valuations of JP Morgan Chase (JPM) for more perspective! Disclaimer: The author did not hold a position in JP Morgan Chase (JPM) or in any of the other companies listed in this article at the time of publication and had no intention of changing that position within the next 72 hours. Logo taken from the Wikipedia; this article is not affiliated with the company in any manner.